International football matches, a battle for Burma’s best latte and a no-holds-barred dance session will keep you busy in Rangoon this week. 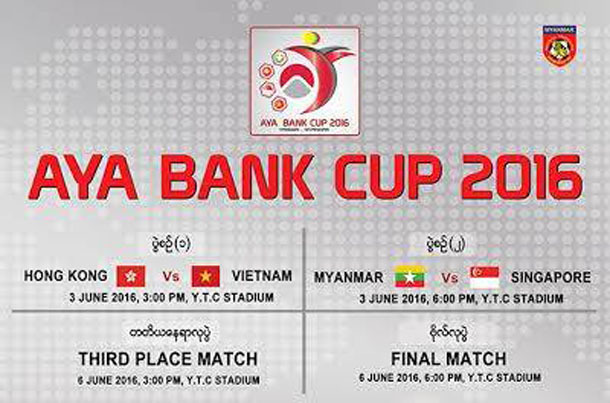 Organized by Ayeyarwady Bank, Burma will host three other countries for a football tournament early next month. Participating teams are from Burma, Hong Kong, Vietnam and Singapore. All four matches will be aired live on MRTV-4 and MRTV. Ticket prices are 1,000 kyats (US$0.84) and 3,000 kyats. On June 3, Hong Kong will play against Vietnam at 3 pm and Burma takes on Singapore at 6 pm. The third place match will be at 3 pm and the final at 6 pm on June 6. Tickets are available at Thuwunna Stadium, Aung San Stadium, Padonma Stadium and AYA Bank branches during office hours. Tickets can also be reserved online here. 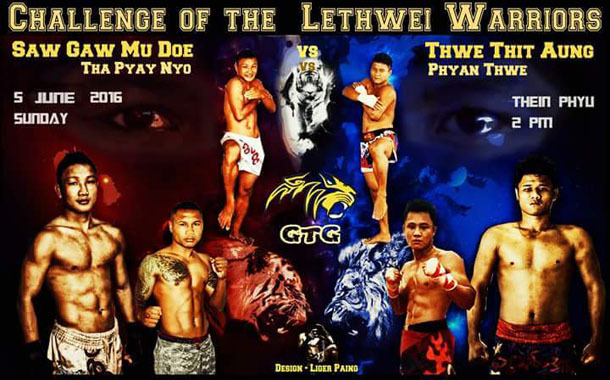 A boxing competition, “Challenges of the Lethwei Warriors,” will be held at Thein Phyu Stadium. The online marketplace shop.com.mm will organize pre-monsoon sales at Capital Hyper Market in Dawbon, Taketa Township. Laptops and computer accessories, handsets, cosmetics, clothes and fashion products will be sold at discounts and there will be a prize drawing. Where: Capital Hyper Market, Dawbon, Thaketa Tsp. 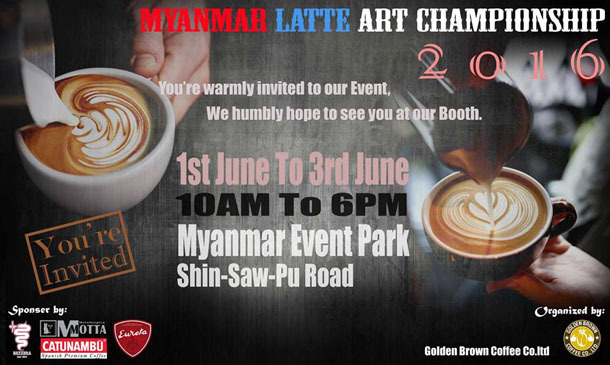 At the Food & Hotel Myanmar 2016 Exhibition, Golden Brown Coffee Company will celebrate the Myanmar Latte Art Championship. Coffee baristas from around Burma can attend and will have a chance to enter the worldwide Barista Championship. Where: Myanmar Event Park (MEP), Shin Saw Pu Street, Sanchaung Tsp. “Dance for Yourself” is being organized by No Lights No Lycra, a dance community that was started in Melbourne in 2009. According to the group: “There is no light, no lycra, no teacher, no steps to learn, no technique, just free movement. NLNL is a space where you can completely let go, shake out the stresses of the week, and lose yourself in the music and the physicality of your body.” Open to all with a suggested 5,000 kyats donation. Where: Goethe Villa Yangon, No.8, Koh Min Koh Chin Road, Bahan Tsp. 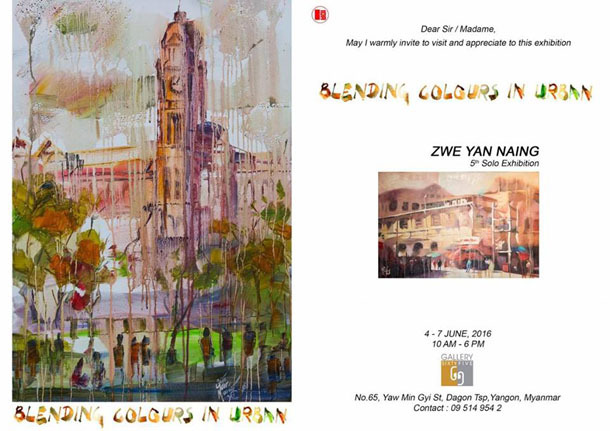 Zwe Yan Naing will have his fifth solo exhibition, “Blending Colors in Urban,” at Gallery 65. There will be a total of 25 works, whose prices range between $800 and $1,200. Where: Gallery 65, Yaw Min Gyi Street, Dagon Tsp. Ko Ko Naing and Letje Preel will hold an arts exhibition entitled “Dark Side.” A total of 18 works will be showcased at the show and the prices range between $500 and $1,100. 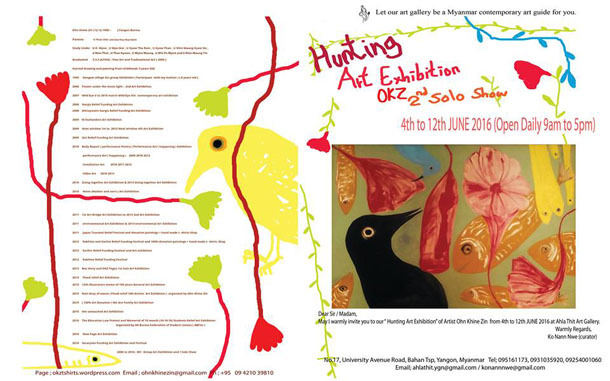 Ohn Khine Zine (OKZ) will have his second solo exhibit at Ahla Thit Gallery. The exhibition, “Hunting,” will showcase 50 paintings whose prices range between $150 and $1,000. An art exhibition titled “Tharmaw Wai Si Ngwe Taung Pyi” (literally, “the pleasant development of Karenni State) will be held at Hninzi Myaing Art Gallery. A total of 88 works from nine artists will be showcased, and prices range between $100 and $3,000. Where: Hninzi Myaing Art Gallery, Hninzigone Home for the Aged, Bahan Tsp. 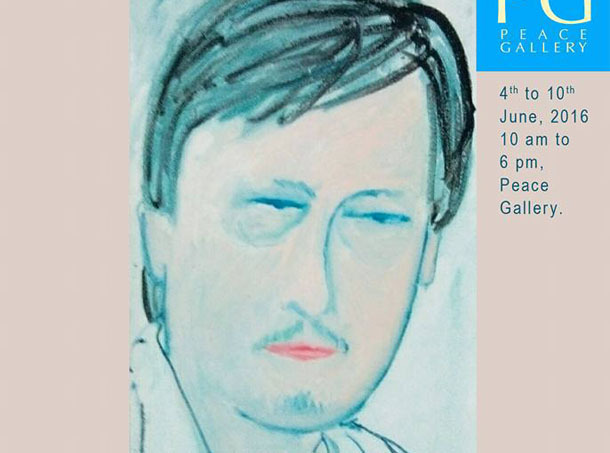 To commemorate the two year anniversary of the death of artist Khin Maung Yin, a memorial art exhibition titled “Kin Maung Yin’s Kin Maung Yin” will be held at Peace Gallery. 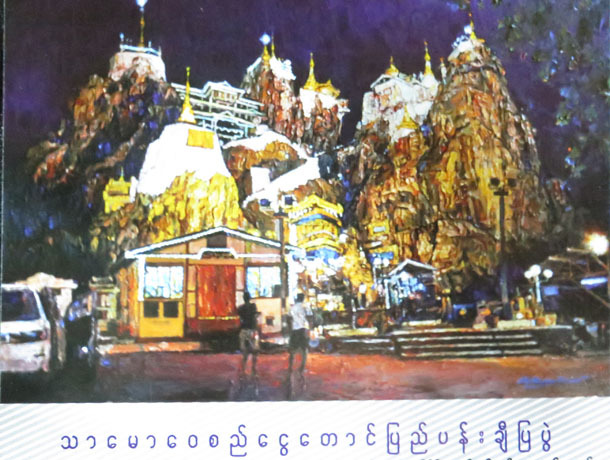 More than 20 works of one of three second-line leaders of modern arts in Burma will be exhibited at the show and some works will be on sale.